Download Jhybo – Para (Remix) ft. Young All Stars mp3 now. 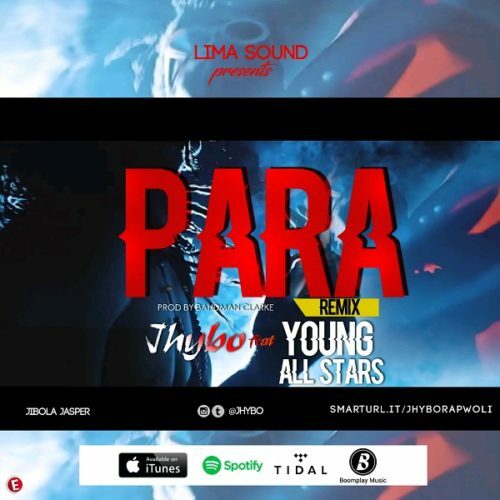 Download Music MP3 Jhybo – Para (Remix) ft. Young All Stars right here. A new piece of music premieres from Jhybo – Para (Remix) ft. Young All Stars out now! Popular indigenous rapper Jibola Jasper better known as Jhybo unleashes the remix to his song ‘Para’. After much rave for the tune the rapper decided to return with a dope remix with Young All Stars. The song was made by Bhadman Clarke. Listen to Jhybo – Para (Remix) ft. Young All Stars below. Enjoy the tune and share! NB: Please be aware that Jhybo – Para (Remix) ft. Young All Stars is hosted outside this particular website as we host NO file. In case of any copyearight claim and request for take down, kindly use our 'contact us' page to put a notice across.